The Most Rev. Henri Isingoma, Archbishop of the Congo and Bishop of Kinshasa. The Most Rev. Henri Kahwa Isingoma, Archbishop of the Congo and Bishop of Kinshasa. A native of the Eastern Congo, Archbishop Isingoma Henri Kahwa Isingoma was born on 24 Nov 1958 in what was then the Belgian Congo He was educated at the Boga Institute and the Nyankunde Institute receiving his diploma in 1977. He prepared for the ministry at the Congolese Church’s Superior Institute of Anglican theology in Bukavu graduating in 1984 and earned a Master of Theology degree at the Faculté de théologie évangélique in the Central African Republic. Following ordination he served as a parish priest in the Eastern Congo and as principal of the church’s seminary from 1993 to 1997. He was elected Bishop of Katanga in 1997. In 2007 he was translated to Boga, and in 2009 was elected third Primate of the Congolese church and translated to Kinshasa. In 2014 he was elected to a second five year term. He is a member of the GAFCON primates council and the Global South primates group. 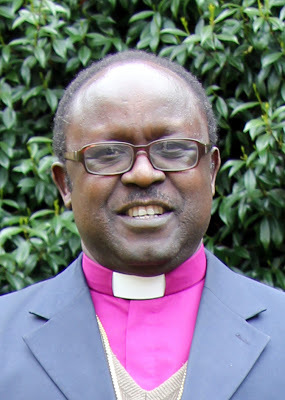 Archbishop Henri is married to Mugisha and they have six adult children.